A lot of users were happy with the effects on anxiety, stress, and mood. Purchasers were mostly happy with the affordable cost and availability of this product in most retail stores. A few consumers mentioned stomach distress from this supplement, stating that other brands did not have this negative effect for them. The overall reaction for NOW Foods Ashwagandha was positive. People were generally happy with this brands ashwagandha supplement. Consumers were pleased with the effectiveness of this product and were happy to see the capsules were plant based. 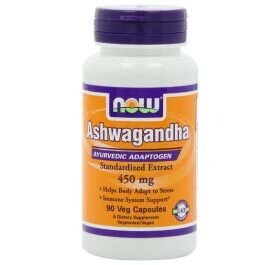 NOW Foods Ashwagandha is a ashwagandha extract that’s designed to bring effective dosage at an affordable cost from a brand that is trusted by most users. One serving of NOW Foods Ashwagandha recorded 450 mg of ashwagandha root extract containing 11 mg of withanolides (2.5%). Overall, NOW Foods Ashwagandha is an affordable ashwagnadha that does have some good traits. Plant based capsules are a plus and having an effective active ingredient formula is good. However, it does contain rice flour as its capsule filler which is trouble some to many users. Contains several ingredients that we deemed to low quality and unnecessary in most cases. Several of the top ranking ashwagandha products do not contain these ingredients thus making this product suffer in its ingredient score. No other ingredients besides ashwagandha extract in its active ingredient formula. Current studies on ashwagandha show that a product containing extract should have at least 1.5% withanolides. Withanolides are said to be a key compound that may play a major role in this herb’s activity. 10 mg to 30 mg withanolides per serving is the range recommend. Per serving this product does fall within the recommend dosage for full potential benefits. One serving of this product recorded 450 mg of ashwagandha containing 11 mg of withanolides, a 2.5% concentration. Does contain Rice Flour and Magnesium Stearate which can cause some stomach distress in some users. NOW Ashwagandha Extract does well when it comes to quality. It has many certifications and uses plant based capsules. However, this product does contain Rice Flour and Magnesium Stearate, which can sometimes be bother some to many users. Thus it does suffer in its quality score for using these ingredients in its capsules. Many users prefer glass containers for their supplements, Now foods ashwagandha is held in a plastic container.